A quarterly, blanket increase in fees! But, not all fees, of course. Just those fees clients don’t typically shop. And, by what justifiable, rational amount? I remember years ago, the "gurus" recommending the "postage stamp" exam fee. The idea was that whenever the U.S. Postal Service raised the price of a regular stamp, we should raise our office call/exam fee to the same number, but in dollars. For example, when stamps went from 25 cents to 27 cents, we should increase our fee from $25.00 to $27.00. Of all things to tie a fee increase to, the U.S.P.S. was probably (or obviously) not the best choice. Why do we not realize that prices are set by the market, not our costs? Lean teaches us that we're not entitled to increase prices just because we feel like it's "necessary." This only works in the short term. Over time, our customers will find alternatives (like Dr. Google) or they'll just stop coming to us as much. Instead of just raising prices, what have we done to improve our practices in order to not need those increases? What have we done to eliminate waste and improve flow in order to provide greater value to our patients and clients so these increases are not needed in the future? What have we done to train our staff to be more multifunctional across different job positions in order to keep payroll down? What have we done to get Lean? 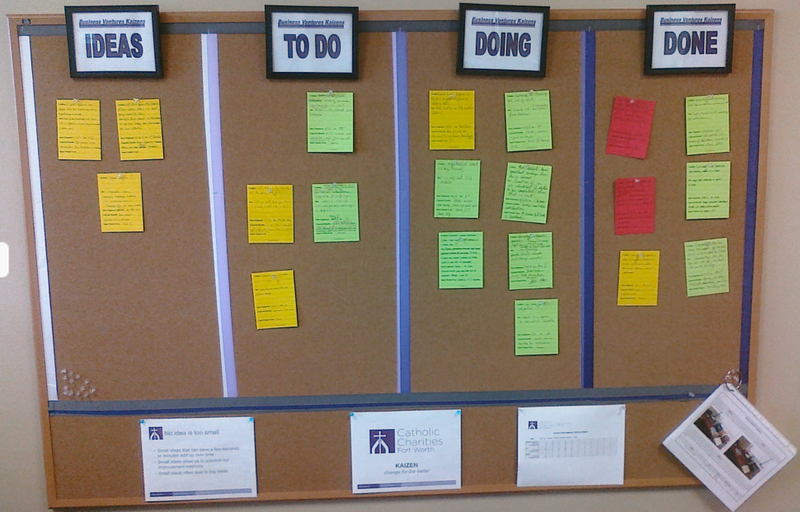 Set up a kaizen board to involve staff in daily problem solving. Allow your staff the opportunity to partner with you in solving problems, rather than, too often, feeling they are the source of problems. They are intelligent, creative assets to the practice. Taking on these small improvement projects teaches them about problem solving and engages them in the hospital. Staff is one of the few assets within your practice with the potential to appreciate in value over time, rather than depreciate, the way equipment, furnishings, inventory and supplies do. Invest in your people now. It will reap big benefits for your business. Run a 5S project somewhere in the hospital. There is probably at least one area of your hospital that could use some reorganization in order to allow better flow and less confusion. Get rid of unused materials. Organize what is left into specific places. Bring in supplies or instruments that you seem to always need, but are never there. Use drawer organizers or small bins. Find a place for everything (the right place!) and put everything in its place. The more frequently used objects should be closest at hand. Clean. Label drawers and cabinets with their contents. Where appropriate, such as the different exam rooms, make similar spaces the same, so there is less confusion between similar areas. Run routine maintenance on any instruments and equipment. Set up a schedule of maintenance for the future. Have staff write the new standard work. Train to the new standard. Sustain the gains. Train your staff in a new procedure or skill. Add a new service or, better yet, cross train staff so flow can be maintained or improved, especially at busy times of the day, week, month or year. 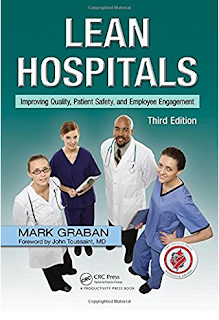 Start scheduling gemba walks (or stands) for everyone in the practice. Sometime during the week, schedule an hour for each staff member and doctor to just watch what goes on in a particular area of your practice. Have them watch the flow and the process. Follow a patient and customer from arrival to departure. What wastes do you observe? What do you learn that you didn’t know before? What problems do you see? What improvements would you and your staff recommend? Then, and this is the most important part, spend time afterwards discussing what you saw and learned. These are sources for improvement projects. Set up a kanban system to improve inventory or other resource utilization. A kanban is a signal. It is part of the Just-In-Time and visual management concepts. The pink kanban card visually signals that this drug needs to be ordered before it runs out. But, only a certain amount. This illustrates a kanban signaling the need for another resource, a doctor in a specific exam room. Decrease confusion in some area by working with staff writing Standardized Work. The first step in improvement is to get everyone on the same page. This is one of the purposes of Standardized Work. Once everyone is “pointed” in the same direction, then improvement can start. It is staff that writes Standardized Work because they know better than anyone what that should look like at the place of work (gemba). Hold a kaizen event to map and eliminate waste in a value stream. Set up a whiteboard to improve visual management in some area of the practice. Start a Lean “book club” with staff. 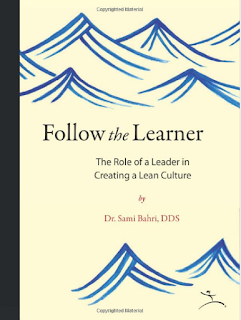 Start learning, discussing and experimenting with Lean methodologies and mindsets. The book that introduced the world to the Toyota Production System. 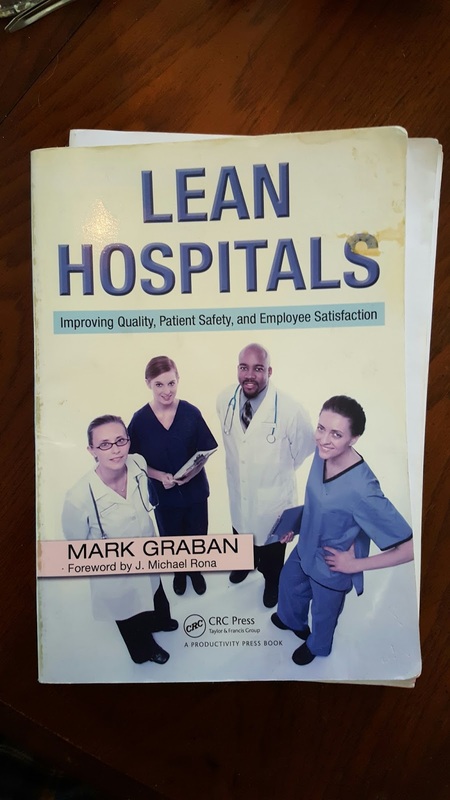 A very good description of Lean from a human healthcare perspective. This is my copy of Mark's first edition of Lean Hospitals. As you can tell, I used it extensively. The guiding principles behind the Lean system. How Dr. Bahri became "The First Lean Dentist." His concept of 'flow' will change how you think about veterinary practice. 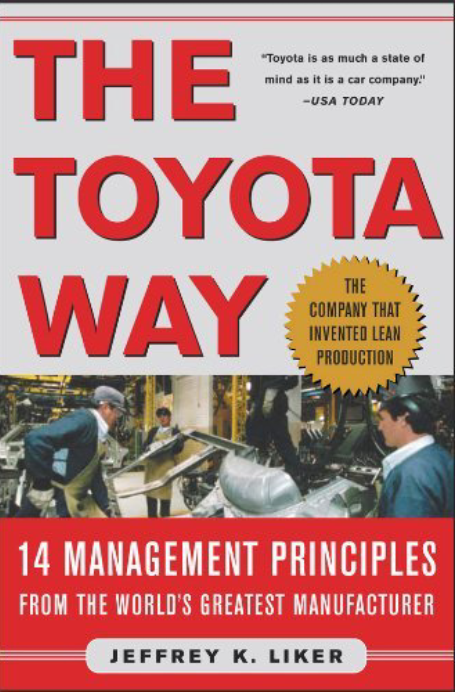 As you can see, Lean is no longer just for auto companies and other manufacturers. 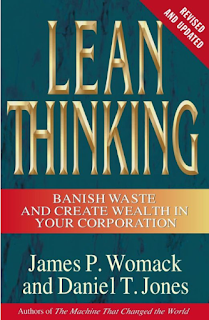 The Lean methodologies have produced incredible gains in virtually every type of business and organization. There is no doubt it can deliver similar results to veterinary medicine. Write your “True North” statement and use it. What would your practice look like if it were perfect or ideal? What do you need to do to start closing the gap between that vision and your current state. What are you waiting for? Over the past few years, there has been growing evidence that veterinary medicine is becoming too expensive for more and more pet owners. Yes, we deserve to earn in accordance with our education. And, yes we need to keep up with increased costs. However, I also feel we have neglected our practice infrastructures and systems. We have wandered from the concept of giving value to our clients from their perspective. We need bridge these gaps. We need a new paradigm. We need to, at least, explore Lean as that new model. I am convinced it can get our professional back on track now and give us a structure to adapt and improve ad infinitum.